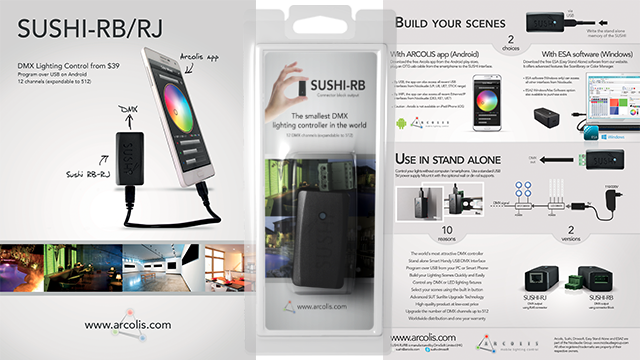 The SUSHI uses high quality hardware designed, a world-class design : stand alone, USB plug&play, 128 DMX channels, expandable to 512, output connection via block or RJ, 2 indicators, one button. SUSHI stands for "Sunlite Universal Smart Handy Interface". With a library of more than 15000 fixture profiles, you can easily patch any fixture into the software and control within just a few minutes. Create your own profiles using the included Scan Library editor. LED lamps need to be connected through a DMX driver. SUSHI is a simple and high quality product. The concept has been designed by worldwide engineers and managers. We integrate : Swiss R&D quality + USA strategy + China production / distribution ! Using the touchscreen or mouse, you can easily build your desired scenes to include patch, groups, steps, levels, colors, fade times, loops etc. A scene using a single step is called a static scene, a scene with multiple steps is called a dynamic scene. Our group has 30 years experience in lighting control, our packages are available in many countries. The warranty of SUSHI hardware is 12 months. Purchased options will not be lost in the event of SUSHI replacement. In stand alone mode, the SUSHI will begin to play the 1st scene. The user can select the next scenes by using the button. If the complete show only uses one single dynamic scene, then the button is not used. The SUSHI also has 2 dry contact ports that can be used to trigger any scene. With the SUT Upgrade Technology you can buy upgrades for the SUSHI: Including the ability to program with ESA2 software for Mac, add more live or stand alone DMX channels, enable the 2 external dry contacts and purchase more licences from our extended software range. Out of the box the SUSHI comes included with 12 channels (stand alone) and 128 DMX channels (live/pc). The number of channels can be upgraded up to 512 directly from our webstore. Quick & easy, no need to return the interface. How to become an official distributor ? GET A TESTING SAMPLE NOW ! Minimum Order Quantity (MOQ) is 50 pieces. SUSHI products are manufactured and distributed by our China company. For small orders, please contact one of our distributors. Arcolis, Sushi, Dmxsoft, Easy Stand Alone are part of the Nicolaudie Group.